There’s nothing as fun as getting ready for baby’s first foods. It’s a milestone in their development, and it’s a transition that every parent looks forward to with a sense of pride. There is a variety of information that exists, however, that can make parents fearful when it comes to the timing of baby’s first foods. How do you know when it’s the right time to start feeding baby solids? If you think that the dates on the calendar have anything to do with starting solids, you’re only partially correct. Baby should be at least four months old before feeding first foods, but there are other more obvious signs that indicate that starting solids is a good idea. · Is baby showing an interest in what you are eating? · Does baby imitate a chewing motion? · Does baby reach for your food during family dinner time? These actions are common for babies, but they alone are not signs of readiness. They simply show that a baby is curious. · Is baby at least four months old and doubled birth weight? · Are they able to sit and hold head up? · Can baby keep solid food in mouth and swallow it (not push it out with the tongue)? · Does baby have good hand–eye coordination (able to look at food, pick it up and put in mouth)? 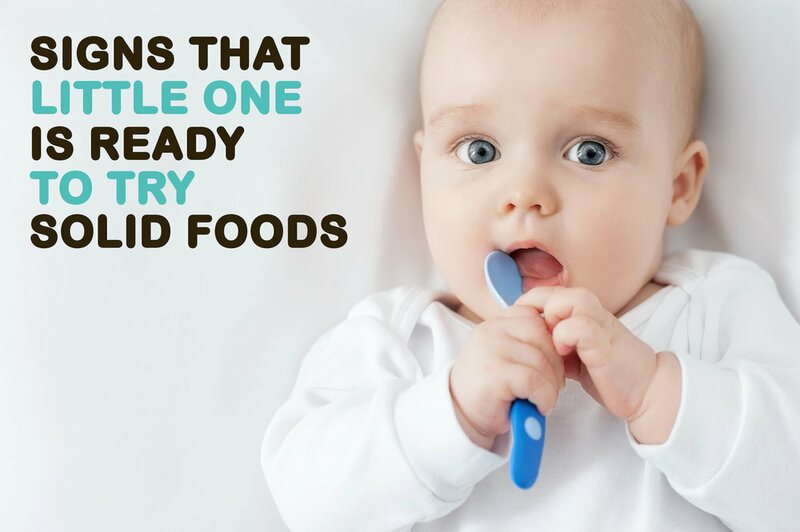 If the answer to these questions is yes, then it’s time for baby’s first foods. The only thing left to do is decide what baby food to start with. Transitioning to first foods can be confusing. The most important thing you can do is to serve your baby only the freshest, highest quality ingredients possible. Organic baby food ensures that first foods are healthy and pure. By beginning with vegetables and introducing fruits, the 21 Days To Solids meal plan will expose baby to flavors and colors that will please the palate and lead to a future appreciation of healthy foods. According to the American Academy of Pediatrics, providing a variety of flavors in baby’s first foods will give them the nutrition they need for healthy growth and brain development. As always, speak to your pediatrician with questions or concerns.